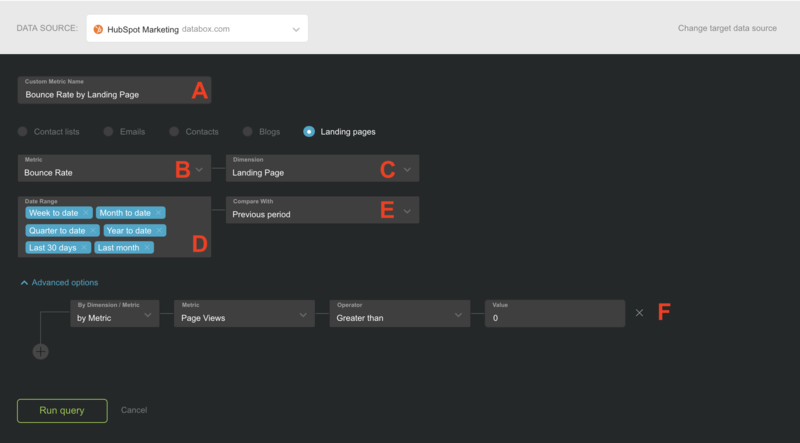 In this article, we will create a Custom Metric using the HubSpot Marketing Landing Page Query Builder in order to highlight key functionalities of the tool. For our example, we will create a new metric that returns the Bounce Rate for each of our active HubSpot Landing Pages. Dimension (required): The dimension parameter breaks down the metric by a common criteria. For this Query Builder, the only Dimension option is "Landing Page." By selecting this option, the metric will be recategorized based on the Landing Page the activities were tracked on. Compare With (optional): Select a Comparison period option. This will be used for "previous line" on Line and Bar Charts, and for calculating the percentage change. Options are: None, Previous period and Same period last year. In our example, we set Filters in order to retrieve data only for "active Landing Pages." We are identifying "active Landing Pages" as those that have Pageviews tracked for the specified Date Range. Filter by (optional): You can filter results by the Landing Page Dimension, or by specific metric values. Filters can be combined using AND / OR boolean logic. Filtered queries restrict the rows that do (or do not) get included in the result. Each piece of data returned from this query is tested against the filter. If the filter matches, the row is retained. If it doesn't match, the row is dropped. When your custom metric is ready, click Save query. This creates a custom metric under your HubSpot Marketing Data Source, with the metric name you specified in section A (i.e., Bounce Rate by Landing Page). Data is only available for published Landing Pages. Since daily data is not available for these metrics, you will want to view your custom Landing Page metrics on a Visualization Type that does not necessitate granularity options. Line Charts and Bar Charts will not be good Visualization Types for this data, but Tables, Pie Charts, and Number Blocks will be.